Samsung will use its homegrown Exynos 8895 chipset in the Galaxy S8 next year, and the company has been testing it for the past five months with clock speeds as high as 4GHz. It was also being predicted that the chipset would make use of ARM’s new Mali-G71 GPU. Now, more details regarding the Exynos 8895 chipset have surfaced. 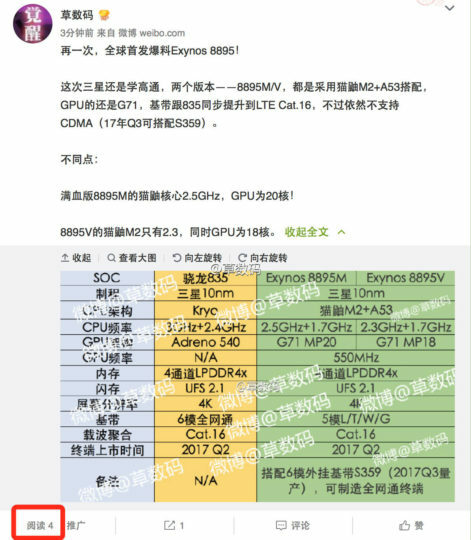 According to a new report straight out of China, there would be two variants of the Exynos 8895 chipset: the Exynos 8895M and the Exynos 8895V. Both chipsets would be made using the South Korean electronics giant’s 10nm FinFET technology. The chipsets would use a combination of four Exynos M2 CPU cores (clocked at 2.5GHz or 2.3GHz depending on the variant) and four Cortex A53 CPU cores (clocked at 1.7GHz). Samsung is making use of ARM’s latest Mali-G71 GPU. The Exynos 8895M would feature a 20-core GPU, while the Exynos 8895V would feature an 18-core GPU. Both these chipsets would be compatible with UFS 2.1 storage, LP-DDR4x RAM, and a Cat. 16 LTE modem. The upcoming high-end smartphone chipset from Samsung would also be able to easily drive 4K content. Samsung could also release a third variant of the Exynos 8895 chipset sometime in Q3 2017, featuring a newer Shannon 359 modem, which is said to be compatible with CDMA networks (useful for North American markets). In comparison, the Snapdragon 835 chipset (which is also being manufactured by Samsung using 10nm FinFET technology) is said to have CPU clock speeds as high as 3GHz. However, higher clock speeds don’t necessarily translate into better performance. nvidia 1070 can barely do 4k properly and that card is double the size of an s7. so this little chip can do 4k?? big bs. My 780ti can drive a 4K display and 4K content on YouTube, that’s all this states, not running high end titles on high settings at 4K. Which aligns with the rumour that the high end model will sport a 4K AMOLED display.